Snake is often called “xiaolong” (small dragon) in Chinese culture, not only because the similarity in appearance, but also due to the mysterious features of the creature in ancient people’s view. It is footless, yet moves fast; it looks soft, yet fierce in attack; it thrives in summer and sleeps in winter. Curious and fear surround the creature and various legends were created about the snake, including some snake-shaped mythical creatures with great power. Xiushe, also called bashe (巴蛇) in some regions, is an extremely huge snake. It measures hundreds of meters long and features a black body and a lighter-colored head. As described in Shan Hai Jing (the Classic of Mountains and Seas), a bashe snake once swallowed an elephant, and it took the snake three years to spit out all the bones. If a man with virtue eats the snake, he will never be bothered by diseases of the heart and belly. The phrase “a man who is not content is like a snake which tries to swallow an elephant” originated from the legend and is still widely used among Chinese people as a metaphor for greed. The huge snake was witnessed attacking people in the Dongting Lake of Hunan Province. Hou Yi, the hero who had shot all of the nine suns, went hunting the monster. He shot the snake first, and chased it to the far west. He killed it by cutting it into two. The dead body of the snake turned into a hill, which was then named baling, the tome of bashe. The city is now called Yueyang of Hunan Province. 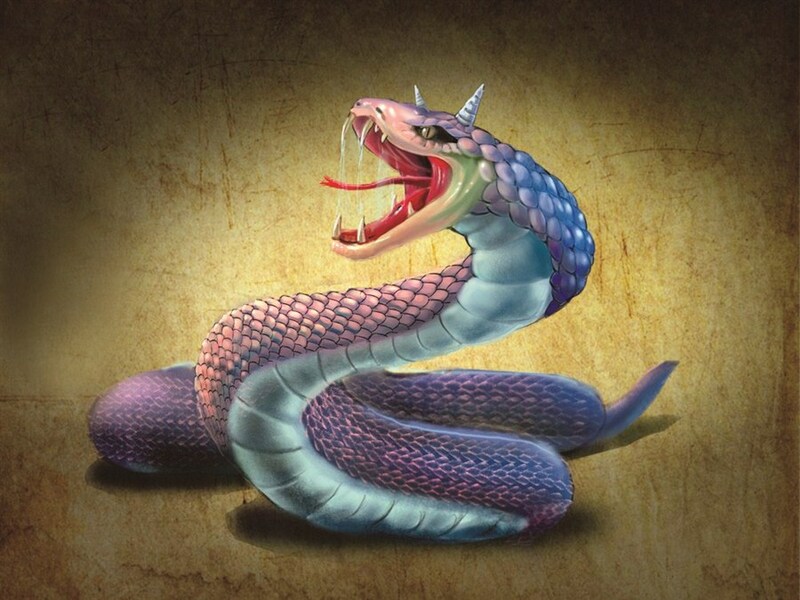 Huashe is a mythical creature with man’s face, jackal’s body and snake’s tail. It moves like snake and it screams like a women bawling or a baby crying. It hardly makes a noise but when it does a huge flood will be released. One story says that in the Spring and Autumn Period (770-476BC), a peasant found a snake-shaped monster when tracing the sound of a baby crying around Daliang City of the Wei Kingdom (AD220-265). Three days later, more than 850 surrounding villages were flooded by the Yellow River. Goushe is a big snake measuring over 20 meters, except for the hook-like forked tail. It is extremely poisonous, fierce and aggressive. It was often witnessed in streams in mountains. The snake spends most of the time in the water, yet often hooked animals and humans on shore and dragged them into the water as food. There are also oral tales among some minority groups warning against children playing in the streams in case of being attacked by goushe. Mingshe is, basically, shaped like a snake except for the four wings on its body. Its voice is as loud as a big bell. Wind comes when mingshe is seen. As recorded in the Classic of Mountains and Seas, mingshe lives in the mountains, which are rich in gold, and jade mines yet there is no grass or woods. There were also other records of mingshe witnessed near mines or tombs with gold and jade which resulted in a belief that the snake guarding the treasures.